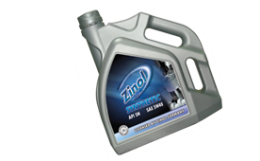 ZINOL SYNTHETIC MOTOR OIL is formulated for improved fuel economy and to provide engine protection and performance required by modern engines. It is compatible with ther conventional and synthetic oils. It exceeds all automobile and light truck warranty requirements for gasoline and turbocharged engines where an API SN and ILSAC GF-5 oil is recommended. It has enhanced wear protection and outstanding resistance to thermal breakdown at high operating temperatures. Protection against harmful deposits and acid which aids in a clean running and lasting engine condition. It is fully compatible with conventional engine oils.